There are new governors in Virginia and New Jersey; a new, progressive district attorney in Philadelphia who is committed to criminal-justice reform; and a transgender woman in Virginia who beat out a 26-year incumbent for a seat in the Virginia House of Delegates. New York City Mayor Bill de Blasio was re-elected for a second term, and Charlotte, N.C., for the first time ever, elected a black woman as its mayor, all of it bringing election night 2017 to a fantastic close for Democrats in some key races. Vi Lyles, a Democrat, “easily defeated” Republican Kenny Smith to become mayor of Charlotte with 58 percent of the vote in unofficial returns Tuesday night, the Charlotte Observer reports. She had picked up an 8,400 early-vote margin and had already beat incumbent Jennifer Roberts in the Democratic primary. In New York City, the New York Times reports that de Blasio “coasted” to re-election for a second term, becoming the first Democratic mayor to be re-elected in the city since Ed Koch in 1985. Transgender candidate Danica Roem has become the first openly transgender person to be elected to a U.S. statehouse. She beat 13-term incumbent Virginia Del.e Robert G. Marshall, who once referred to himself as Virginia’s “chief homophobe.” Earlier this year, Marshall introduced a “bathroom bill” that died in committee. Elsewhere, in the state of Virginia, there were two big gubernatorial victories Tuesday night. Lt. Gov. Ralph S. Northam, a physician and Army veteran, had a great victory over Republican nominee Ed Gillespie—leading Gillespie by almost 9 percentage points, with 99 percent of precincts reporting, and making his the widest victory for a Democratic candidate for governor in decades, according to the New York Times. 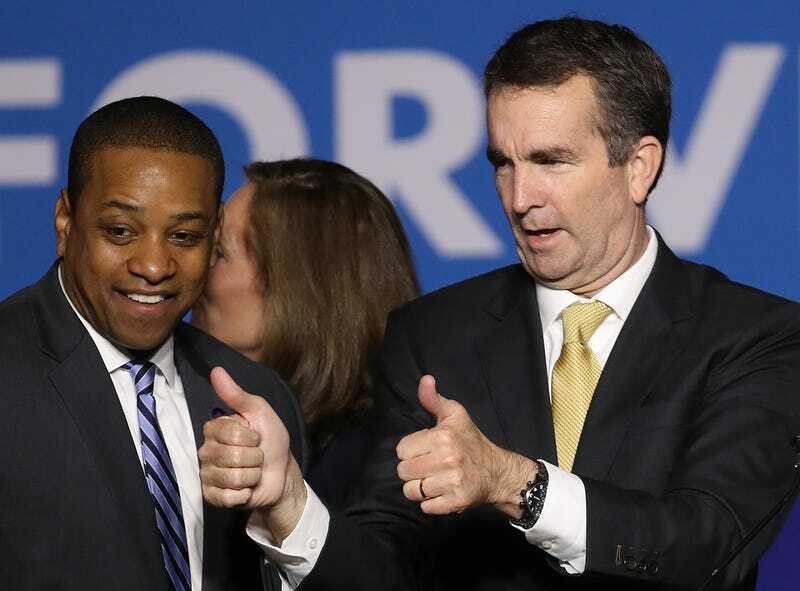 Alongside Northam’s victory, Democrat Justin Fairfax was elected to take Northam’s place as lieutenant governor of Virginia when Northam ascends to the higher state office. Fairfax is a former federal prosecutor who beat out Republican state Sen. Jill Vogel. This will be the first time that Fairfax holds political office. Four years ago, he narrowly lost the Democratic nomination for attorney general. In what is sure to be the biggest sign of change where criminal justice in Philadelphia is concerned, progressive Democrat Larry Krasner beat Republican Beth Grossman by more than 40 percentage points to become the city’s next district attorney. Krasner is a civil rights and defense attorney who has represented Black Lives Matter. He’s also sued the Police Department and City Hall more than 75 times. He campaigned on promises not to seek the death penalty or to bring cases that are based on illegal searches. Krasner, who once joked that he’d “spent a career becoming completely unelectable,” was overwhelmingly the people’s choice on Election Day.